Not being a big fan of loud holiday clothing (I’m pretty sure Christmas sweaters should be banned) I don’t usually dress up much for the 4th of July. But stars are super trendy right now, and this simple accessory is the perfect way to add some celebratory bling to your 4th of July. 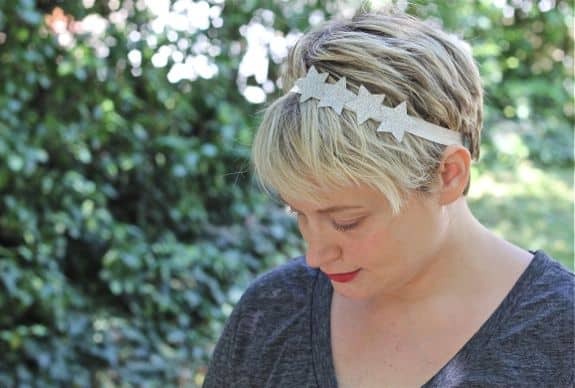 I made a headband and a comb version – they really make me wish I had long hair. A messy updo with a star combo would be so pretty! Alas, long hair is not meant to be for me. I just got it all chopped off again so I’m feeling a bit like I have no hair right now. Might as well dress it up then, right? 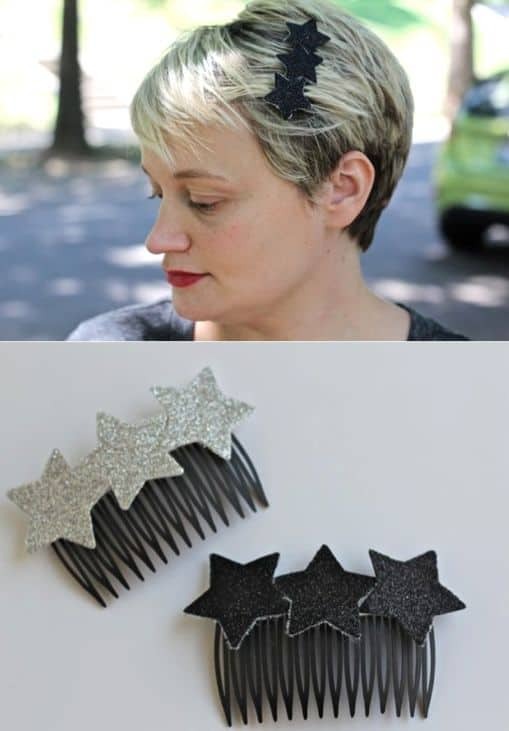 Star punch, sparkly paper (mine came from the felt section at Hobby Lobby), headband or comb, and glue. 1. 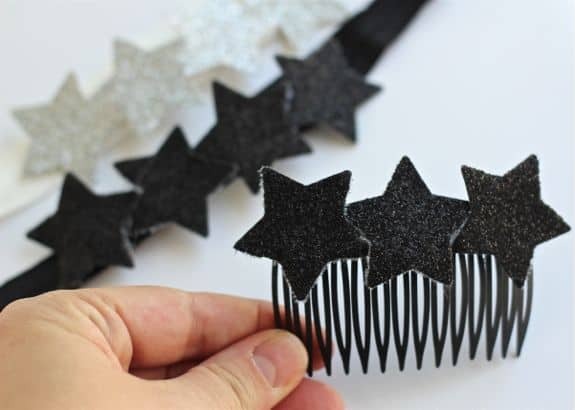 Use a star punch to cut out the number of stars you need. I used 3 for the combs and 4 for the headbands. 2. Line them up how you want them and then flip them over. 3. 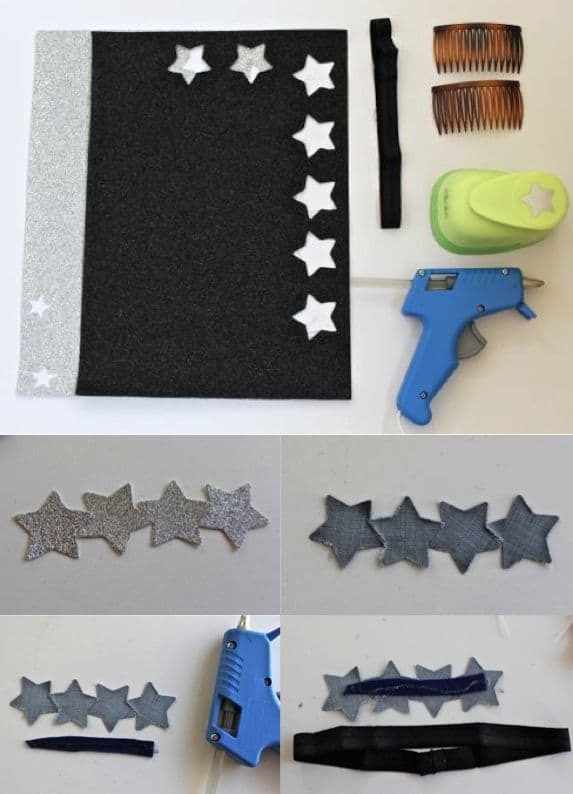 Attach a thin strip of felt or scrap fabric to the back of the stars with glue. 4. Put glue on the back of the felt/fabric and attach to comb or headband. I am not a fan of headbands, and I am not american. Very cute! I love the headband. :) Thanks for sharing! i love the headband on your cute haircut!! I’m not a fan of cheesy holiday clothing either. But this is super cute! And the best thing is, unlike all those obnoxious 4th of July t-shirts and such, you can actually wear this year-round. I’ll be featuring you soon during Sticker TIME! How cute! I’ve never been to a Hobby Lobby but I just found out that they do have one in Minnesota about 1 1/2 hours away. We might just have to take a day trip to check it out! So cute! And I just happen to have some sparkly paper and that exact star punch on hand – yes! Okay, now you’re just showing off! LOL Just lovely Stephanie. I think they’d be good for New Year’s as well. Love the blog makeover as well. This is awesome! I was wondering how you did this! Lots of possibilities with these cute little stars (and a million other shapes! ).